Zion Market Research has published a new report titled “Track and Trace Solutions Market by Technology (RFID and Barcodes), by Product (Software Solutions and Hardware Systems), by Application (Aggregation Solutions and Serialization Solutions), and by End-User (Medical Devices Companies, Pharmaceutical and Biopharmaceutical Companies, Cosmetic Industry, and Others): Global Industry Perspective, Comprehensive Analysis, and Forecast, 2017—2024”. According to the report, the global track and trace solutions market was valued at approximately USD 1.4 billion in 2017 and is expected to generate around USD 4.6 billion by 2024, at a CAGR of around 18.72% between 2018 and 2024. Pharmaceutical and medical device industry is experiencing rapid growth in both developed and developing nations. However, the industry is facing issues related to the supply chain process, such as shipping delays, counterfeiting, product recalls, and theft. Track and trace solutions, such as automatic identification technologies and software, are both effective and reliable in ensuring proficient delivery of components and materials to customers. Track and trace solution technologies help to improve security and drug traceability. Track and trace solutions play a vital role in the distribution and logistics of medical devices. Stringent regulatory requirements for the implementation of serialization are the major growth driver of the track and trace solutions market globally. 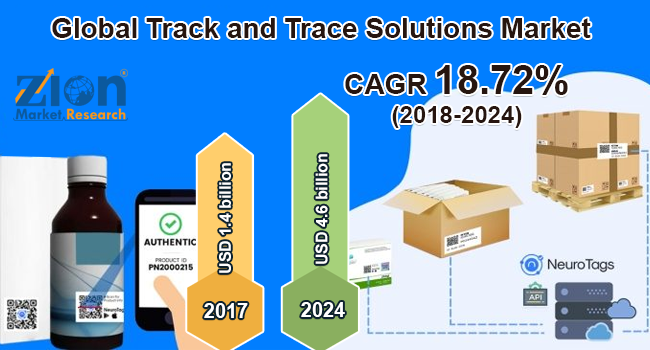 Other factors that are likely to contribute notably toward the track and trace solutions market in the estimated timeframe are increasing emphasis on brand protection by manufacturers, rising product recalls concerned with packaging, and emerging pharmaceutical, biopharmaceutical, and medical device sectors. However, huge aggregation and serialization costs might restrain this market’s growth in the years ahead. The track and trace solutions market is segmented based on technology, product, application, and end-user. By technology, this market is bifurcated into Radio-Frequency Identification (RFID) and barcodes. Barcodes are sub-segmented into 2D and linear barcodes. Barcodes held the largest market share in 2017. The 2D barcode segment held the largest market share in 2017, due to increased product use in biopharmaceutical and pharmaceutical for packaging. By product, this market is bifurcated into software solutions and hardware systems. Hardware systems are sub-segmented into monitoring and verification, printing and marking, checkweighers, labeling, barcode scanners, and RFID readers. Software solutions are sub-categorized into line controller, plant manager, bundle tracking, case tracking, warehouse, and shipment manager, pallet tracking, and enterprise and network manager. Software solutions dominated the market, with a revenue share of about 57%, in 2017. Aggregation solutions and serialization solutions are the application segments of track and trace solutions market. Aggregation solutions segment is further categorized into the case, pallet, and bundle whereas serialization solutions into bottle, blister, vials and ampoules, carton, and medical device serialization. Serialization solutions segment held the largest market share in 2017, owing to stringent government regulations for serialization implementation globally. Medical devices companies, pharmaceutical and biopharmaceutical companies, cosmetic industry, and others comprise the end-user segment of this market. By region, North America is projected to remain at the leading position over the forecast time period. North America region held about 43% share of the global track and trace solutions market in 2017, owing to the presence of advanced healthcare systems in the U.S. The Asia Pacific region is expected to grow rapidly in the future in the market for track and trace solutions, due to the presence of a large number of pharmaceutical companies in this region. Few of the key players in the track and trace solutions market include METTLER TOLEDO, OPTEL Group, TraceLink, Systech, Xyntek, Antares Vision, Axway, Sea Vision, Adents International, Zebra Technologies, Siemens, ACG Worldwide, and Körber Medipak Systems, among others.